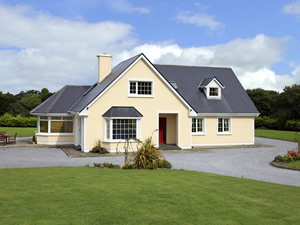 Beaufort in Ireland-South a perfect base for your holiday in County Kerry. Find out more about Beaufort below. Set at the base of Carrantuohill (Ireland's tallest mountain) you will find this delightful home sitting on just over an acre. Located 10 miles from Killarney, 3 miles from the famous Kate Kearney's cottage (Bar and restaurant) this is an ideal property for the keen explorer with guided walks to the mountain summit and stunning walks through the Gap of Dunloe. If you are not feeling quite so adventurous, a trip into Killarney town is for you. With its quirky shops, delicious restaurants and lively pubs, the town is situated in 26,000 acres of lush parklands, waterfalls and mountains.Shop 1 mile. Pub. Restaurant 3 miles. Beach 20 miles. GF: lounge, kitchen/diner, conservatory, double with ensuite shower room. FF: 2 doubles all with ensuite shower rooms, twin, bathroom with separate shower.Oil by meter read and electricity by meter read, open fire with starter pack, linen and towels included, cot, high chair, TV, dvd player, radio, freezer, fridge with small ice box, microwave, dishwasher, w/machine, dryer, freeview, internet access, partially enclosed garden, patio furniture. Sorry no pets. We have the following details listed regarding Beaufort accommodation accessibility but we would recommend that you always confirm these prior to booking with the owner or operator. Beaufort is a great base to explore the wonders of County Kerry and you will find plenty of activities near by. Beaufort is at Lakes of Killarney, County Kerry. Check out the map below for directions, use the controls to zoom in. If you have stayed at Beaufort why not add your thoughts, comments, pictures to our Facebook page? Don't forget to add the name/town/page link to your comment so its attributed to the correct place. Please keep it polite, we are sensitive souls! Find Cottage Holidays works closely with independent cottage owners and leading holiday travel operators to provide you the widest choice of self catering accommodation across Ireland. Beaufort in County Kerry is available through: Imagine Ireland. If you are heading to County Kerry then check out our guides to local holiday attractions, gardens to visit and county shows to see.